Andy Picarro was Born in Pittsburgh, PA and raised in central New Jersey. Andy began doing standup at the Comedy Village in New York City and was a regular at The Underground Lounge. 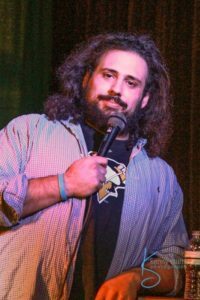 Now residing in Pittsburgh, Andy regularly works at the Pittsburgh Improv and has opened for; Pauly Shore, Josh Blue, Todd Glass, Pete Davidson, Joey Diaz, Otto and George amongst many others. Andy has performed in many Comedy Festivals including; The Accidental Comedy Festival, Whiskey Bear Comedy Festival, The Derby City Comedy Festival. Come see him return to the Mutiny Radio Comedy Festival! Click on the link for the podcast!